Scandals engulfing the country’s elite are not touching the 2016 Olympics. This could very well be by design. There is a fevered media narrative about Brazil currently swamping the airwaves: a narrative with two stories existing in the same space, yet being told as parallel dramas. One is about the state-oil corruption fracas, known as the Petrobras/Operation Car Wash Scandal. This investigation, alongside an inquiry into illegal budget manipulation, threatens to bring down President Dilma Rousseff and the Workers’ Party (PT) government that has ruled South America’s largest nation for the last 12 years. Even though there is evidence of hundreds of millions in bribes, touching every corner of the political establishment, the media and investigative focus has been lasered in on the PT. The other narrative involves hand-wringing over how in the world Rio de Janeiro is going to host the Olympics, given this level of turmoil, not to mention how the city will possibly handle the unbuilt Olympic construction projects, fetid water, and fears over the Zika virus. To understand why this is happening now, why the right wing feels so confident, and how the Workers’ Party opened the door to its enemies, start with the eight-year presidency of a once-penniless youth and factory worker, Luiz Inácio Lula da Silva. In 2011, Lula left office after two terms, in the words of President Obama, as “the most popular politician on earth.” His approval ratings were driven by a Brazilian economy that was experiencing 10 percent annual growth, due to massive investment of international capital in the Brazilian stock market, Lula’s seizing of peasant and native lands for development, and the expansion of oil drilling. This neoliberal model carried by a left-wing folk hero inspired economists to call Lula “the IMF’s favorite president.” The Financial Times was so besotted with him that it suggested he be named to head up the World Bank. This was difficult for many of his supporters to swallow, particularly the thousands who were expelled from the Workers’ Party for agitating against this agenda. Yet Lula maintained a powerful base of support by investing the nation’s stock-market windfalls into antipoverty programs and increases in the minimum wage, which made real dents in Brazil’s staggering levels of destitution and economic inequality. Lula also leveraged his status to pass laws empowering the judiciary to root out endemic and long-standing corruption in Brazil’s political and ruling class—laws that are used today against the Workers’ Party. Fast-forward to today, and these words have the air of the tragic. The World Cup was met with widespread protests, rooted in people seeing the rapid construction of unneeded stadiums while basic needs like healthcare and education were ignored, all while the economy stagnated. These demonstrations ran the gamut politically, depending on the region: Some were right wing, with open calls for military coups; others had left with socialists and expelled Workers’ Party members leading the charge. Overwhelmingly, their primary character was young and fed up. Yet today, with oil prices at an international low and Brazil’s economy in free-fall, shrinking at 4 percent already this year, the right-wing political forces and Big Capital are seeing this as the time to strike, seizing Lula in his own home and frog-marching him down to police headquarters for questioning. The Brazilian stock market actually rose upon news of his detention; his status as the IMF’s favorite leader is clearly something in the past. Dilma has spent her entire second term desperately trying to appease every faction of the ruling class and the institutional right. This effort at an alliance has failed. The PT government has long consisted of a pact where investors profited mightily and the streets were quiet thanks to progressive reforms and the general sense that the left was in power, and this model was a smashing success for a decade. Domestically, their biggest partners in crime were state-centered heavy industry, especially the four construction giants—Odebrecht, OAS, Camargo Corrêa, and Andrade Gutierrez—and privatized or semi-privatized titans like Petrobras. They showed off their babies: big projects like the Belo Monte Dam and the redirection of São Francisco River, and the crowning glory on the world stage was supposed to be the World Cup and the Olympics. All this lies in ruins and the pact is over. The system is in crisis, economically and politically, and the PT no longer serves a purpose for capital, and scapegoating them is a convenient rallying cry for a new right-wing movement. The result is that now 68 percent of the country wants Rousseff to be impeached or to resign. But what’s waiting in the wings is very dark, very frightening, and getting organized. Yes, the very anticorruption laws signed by Lula are being used against the PT, and may end with Lula’s imprisonment, and, yes, the man is miles from being the saint of his dwindling supporters’ dreams. Yet this is just one prong of attack. The investigation has been conjoined with a coordinated media offensive by the country’s largest outlet, the right-wing idea engine Globo, and mass demonstrations egged on by this Fox News-on-steroids media giant. These protests staged last weekend brought several million people into the street. NBC’s Chuck Todd tweeted a photo of this under the caption, “The People Vs. The President.” But what people? The demonstrations have had a decidedly right-wing, militaristic character. Yes, many in the streets are just fed up with corruption in politics. But many more are openly calling for a military coup. In a country where that was a reality just a few short decades ago, it is a threat with teeth. The right is attempting to take advantage of this climate to create a kind of state with more in common economically with Pinochet’s neoliberal fever dream in Chile than the current welfare state, however flawed. This is seen in one of the organizations at the heart of the protests, the Free Brazil Movement. As Rio-based freelance journalist Catherine Osborn reported, this group was “founded by members and alums of another group that’s been spreading fast in this country: Estudantes Pela Liberdade, ‘Students for Liberty.’” Students for Liberty is for “cutting government spending, privatizing state companies, and reducing regulation.” It has received funding from US right-wing billionaire Charles Koch. 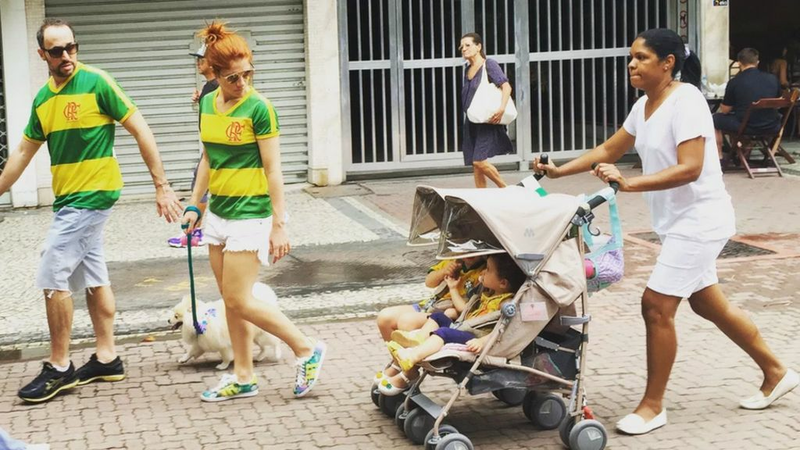 This Koch vibe on the protests has been exemplified in one viral photo of two demonstrators—a white woman and man marching with their purebred dog, while their nanny—black—pushed their baby behind them. The role of the Olympics in the politics of impeachment is critical. First and foremost, there are enough lurid tales of kickbacks, bribery, and forced displacement swirling around these Olympic Games to keep the Brazilian judiciary busy for the next decade. Construction magnate Marcelo Odebrecht, whose family’s eponymous company helped build many of the World Cup and Olympic facilities, was sentenced to 19 years in prison. Yet this conviction was for his role in the Petrobras scandal, and the case did not touch the Olympics side of Odebrecht’s criminality and corruption. Paes and Pezão of the PMDB oversaw a process where Olympic facilities were bid upon by “consortiums” of real estate firms, like the Rio Mais (More Rio) syndicate, which included Odebrecht as well as the companies Andrade Gutierrez and Carvalho Hosken. Paes and Pezão ignored the Rio-based left-wing organizations and NGOs agitating against these kinds of consortiums. They demonstrated, argued, and even designed alternative Olympic plans to combat these syndicates, which they maintained were both artificially inflating costs because of the absence of competitive bidding and colluding in transparent efforts to displace people in an effort to grab more of Rio’s valuable real estate. As Chris Gaffney, for years a Rio-based activist/journalist, said to me, “The Construction Industrial Complex of Brazil is similar to the military Industrial complex of the USA. Instead of Halliburton and the Carlyle Group, Brazil has Odebrecht and all the rest.” The police chief of Curitiba, Igor Romário de Paula, told Reuters Brazil in November that the car-wash investigations “would reach Olympics contracts,” but there has been zero evidence of anyone in the judiciary making that obvious leap. 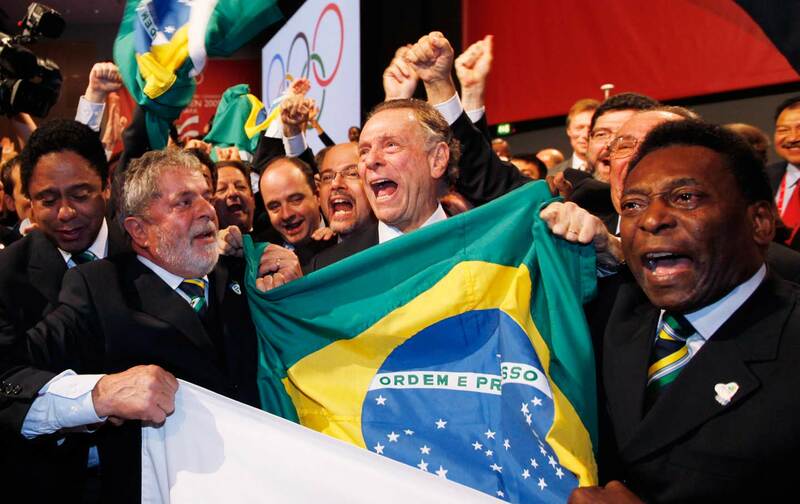 And here is how the Olympics could lead to a judicial coup in Brazil. If Rousseff’s government falls and the Games go smoothly, it could contribute to the utterly undeserved image that Rio Mayor Eduardo Paes is trying to cultivate as a competent, pro-business manager who makes the trains run on time. This narrative ignores how the Olympics have been organized on the backs of the poor. It ignores the brutal debt, displacement, and militarization that have surrounded the Games. These facts will be forgotten to create a counter-narrative of a country cleansing itself through the successful staging of Olympics glory. This is a narrative that will thrill audiences, stoke Brazilian nationalism, please international investors, and make the Koch brothers light their cigars. Ignored will be the ways that the lighting of the Olympic torch could also facilitate the lighting aflame of Brazil’s fragile democracy. Editor’s Note: An earlier version of this piece stated that Lula left office after being diagnosed with throat cancer before the end of his second term. It has been changed to correct this mistake.